Nothing in China is what it appears. For decades, China has dreamed of hosting the Olympics as its way of demonstrating to the world that it has "arrived" as a major power in its own right. Even before the Communist takeover in 1949, patriotic Chinese dreamed of the day that their country would occupy the place of honor on the world's biggest sports stage; with a Communist government whose most powerful appeal to its people is nationalism, the Olympics are even more important. With the 2008 Olympics awarded to Beijing, the Chinese government has pulled out all the stops to make them the most spectacular, the most incredible, the most perfect Olympiad of all time. No expense or inconvenience was too great, no detail too small for the attention of the powers that be. Possibilities of rain? Bombard the clouds for miles around with silver iodide to make sure the rain falls anywhere but the Olympic plaza. Traffic congestion? Build three new subway lines in a handful of years, opening them the week before the Olympics, and ban most normal traffic from the streets for the duration. Smog problems? Shut down all factories with a stroke of a pen. Unauthorized logos might be seen on TV? Keep tape over brand names of anything not made by an official Olympic sponsor, courtesy of roving tape-replacement teams. If human imagination can conceive of it, Chinese ingenuity and manic thoroughness has planned for it. Considering that there are over a billion Chinese, it's all good for us to know them for what they are. The brilliant spotlight and giant megaphone of the Olympics provides the perfect opportunity; China's masters have indeed put on a show. 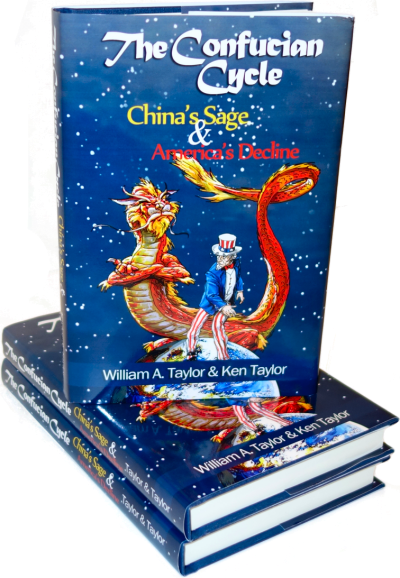 They have vividly shown the entire world what China has become, and is becoming. In doing so, though, they have painted a picture that may not necessarily be exactly what they intended. One of the hallmarks of the Olympic coverage, sure to warm the cockles of their Chinese hosts' hearts, is the universal awe with which the commentators have viewed their works. The Water Cube! The Bird's Nest! The world's biggest and arguably most beautiful airport terminal! Miles of beautiful new subways that blew away Chicago's Mayor Daley, who presides over a deteriorating network of antiquated and collapsing relics. The predominant reactions seem to be a combination of "This is great!" and "Why can't we do this back home?" Well, why can't we? A quick look at the TV news in any Western location where a major construction project is planned gives the answer: protesters and lawyers. There is no improvement so small but that it cannot be stopped by an opponent's lawsuit, no infrastructure so important but what concerns over pollution will call for hearings, environmental impact surveys, computer modeling, expert witnesses, and the whole panoply of red tape with which the Western world is so infested. London planners worked thirty years to get permission to build Heathrow Airport's new Terminal 5; New York's Second Avenue Subway has been planned, and intermittently worked on at great expense, even since the 1920s and the first passenger has yet to ride it. The problem is that in a democracy, nobody has the power to say "Yes" and everybody has the power to say "No." Not one Western country has a one-stop development approvals agency whose word is law; there is always one more bureau, one more application, and if that fails to stop the project, one more court injunction to overcome. In a dictatorship, the dictator says, "Do it." Everyone does it because they don't want to be shot. China summarily rounded up all the usual suspects who might possibly protest at the Olympics and packed them off to remote concentration camps for the duration. Two disabled old ladies who filed for a legal permit to protest the loss of their homes, in an official protest zone, instead were summarily served with a one-year sentence for "reeducation through labor." If we could do that with the Clamshell Alliance, we could build the nuclear power plants we need; if we could do that with the environmentalist wackos, new road construction would be easier; if we could do that with the public-sector unions, our subways and trains would work with Beijing efficiency. Is that what we want? It's a little scary to see naive Olympic visitors on TV and on the Internet, longing for a benevolent dictator to clean up the intractable messes created by our bureaucracy. One of Mussolini's famous achievements was that he "made the trains run on time." What's not to like about that? Well, if that's all he did, it would have been a worthy achievement. Unfortunately, in China as well as Italy, you don't often find a dictator who confines himself to ordering good things. Mussolini's way of guaranteeing timely trains was effective but blunt: if a worker couldn't or wouldn't get with the program, he shot them and called up the next one. In turn, Mussolini's victims' survivors shot him and hung his body by the heels as soon as they got the chance. As we all know, even things that are indisputably good can have bad side effects. The beautiful Olympic district in Beijing will be an asset to the city for years to come; it's the sort of infrastructure that an American mayor would kill to have. Over the past two decades, as skyscrapers and shopping malls have burgeoned throughout the city, only 2 percent of Beijing's original architecture has gone unchanged. Throughout Beijing there are miles of traditional hutong neighborhoods slated for demolition where the Chinese character chai - destroy - is spray-painted on every building, scrawled like some eerie scarlet letter. Not only were lives overturned and property destroyed; countless migrant construction workers were killed in accidents covered up by the authorities. These unfortunate peasants might have a slightly different view of the glories of progress, but they are kept far out of sight, not to be interviewed. We had a similarly cavalier attitude back when much of America's most impressive infrastructure was built. How many immigrant Chinese and Irish workers were killed during the construction of the transcontinental railway and the digging of the New York and Boston subways? How about the upheaval of urban renewal in the 1950s and 60s when older neighborhoods were bulldozed to make way for new highways? Nobody much knew, and certainly nobody important much cared. At least the Constitution guarantees that property owners be paid for losing their homes, and summary executions of American protesters are exceedingly rare; in China where property and human rights are spotty at best, paying for what the government takes isn't much of an impediment. If we could do construction as the Chinese do, or in the way we used to do it, we'd certainly get a lot more done. You can even make an argument that our standards of safety and planning are ridiculously excessive and that workers know the risks when they take the job, but as long as our legal system allows anyone and everyone to sue to stop anything, our physical plant will inevitably fall further and further behind what a well-regulated dictatorship could accomplish. Nobody has ever claimed that a democracy, or even a republic, is very efficient or effective. Having one guy on top who can order that Things Get Done Or Else is, for sure, a way to Get Things Done. They may even be very good things that look great for the visitors - but if you have to actually live there, it may not be so great, as China illustrates. The second great lesson Beijing teaches us about how to run a fantabulous Olympics is, cameras can be lied to just fine. The spectacular opening ceremonies, intended to set the standard for all other Olympiads to aspire to, were the product of as much fakery as organization. The giant red fireworks footprints leading to the Olympic Stadium came from a computer, not a rocket. The adorable little girl who sang at the ceremony was lip-synching; the real singer wasn't cute enough and had to sing in a studio, hidden from view. Why are we not surprised that, as CNN reports, "Decision came down from Politburo, musical director says"? That's exactly the sort of thing a Politburo is for - which is why they have one, and we don't. Every government since the beginning of time has wished for the power to dictate what people think by having control over what is published. China's Communists are used to a compliant news media which says only what they are supposed to say. In such an environment, government fraud and deception is sure to work - until hordes of curious Western media start poking around. This handful of revealed phoniness is just the tip of the iceberg. Reports are flooding out about Chinese athletes who are too young to be eligible for the Olympics. The International Olympic Committee is ignoring this because the athletes' passports give an eligible birth date. Whom do they think prints passports? If the Chinese Politburo felt it necessary and advisable to switch one little girl for a slightly cuter one for nothing more than show, why wouldn't they decree false information be placed on a passport if it could earn more gold medals for the Motherland? It's more difficult to imagine that they wouldn't. The mass maneuvers were perhaps the most impressive bit of the opening ceremonies. 2008 drummers drummed on antique drums in absolutely perfect unison. It's reported that 16,000 performers participated - an entire stadium-full, not to watch, but to participate. That's incredible art, but it also serves as a warning: China is a very big country with a lot of extremely well organized people under a very authoritative government that can command them to do just about anything and they will do it. There can be no doubt that there are a great many countries and leaders who are watching the Chinese show and comparing it to America's difficulties in handling even the simplest things and thinking, "Which side would I rather be on?" If you are picking an ally, would you prefer one with the power to decree that Something Be Done, and it Gets Done? Or an ally who cannot lift a finger without being excoriated by his own press and greeted by thousands of rampaging protesters everywhere he goes? The Chinese understand the power of prestige better than we do. China's Communist leaders set out to use the Olympics to display the New China for all the world to see. They succeeded - not entirely as they'd planned, perhaps, but things have gone their way more often than not. There's nothing wrong with this, and in fact it's probably good. Maybe their spectacle will serve as a much-needed wakeup call. What's truly sad is what the Chinese have revealed about those who claim to care "only about the sport" - the International Olympic Committee. Far from defending the integrity of competition and its reporting, the IOC has been nothing more than the lapdog of their hosts. Some International Olympic Committee officials cut a deal to let China block sensitive Web sites despite promises of unrestricted access, a senior IOC official admitted on Wednesday. In other words, the Chinese abandoned their promise of no censorship and the IOC said, "That's fine as long as you leave us alone." What hypocrisy! After giving their excuse that giving China the Olympics would push it to be more open, when push came to shove, the IOC was the one that got pushed. We've already noted how the IOC is turning a blind eye to serious, credible, documented eligibility fraud of the Chinese gymnastics team. If the IOC cared only about sport and nothing about human rights, wouldn't you at least think they would defend their own sporting rules? After all, isn't the integrity of Olympic gold the reason it is considered the world's highest athletic honor? Men and women work and train for their entire lives just to have a shot at wearing that medal; why would the IOC for one moment consider tarnishing it? The gold medals awarded at the Beijing Olympics are mostly made of silver, the Games' organising committee admitted on Monday. Each medal contains only six percent pure gold, committee secretary-general Wang Wei said. The rest is silver, he added. And apparently it has been this way for some time. Nothing could be a more appropriate symbolism for the Beijing Olympics: it is beautiful, shiny, and impressive, and not entirely valueless - but nothing like as glorious as it appears. What a pity. Michelle Malkin spent her column chewing out the Olympic Committee for for being in "deeper denial than John Edwards." She says they're in close competition with the United Nations for "the title of most feckless International agency." China spent forty billion. Do you think that covered the IOC's bribes? FRONTLINE/World just put up a great audio slideshow about the Hutong - Beijing's old courtyard neighborhoods. I think it's one of the better peeks into this microcosm of life in Beijing that I've ever seen and grapples with the question of how growing mega cities should deal with poor communities and traditional architecture that inhabit in the heart of the modernizing cities. The topic is one of my personal obsessions; here is a video I produced about Dharavi, the massive slum in the heart of Mumbai set to be redeveloped. Western cities razed their slums years ago, but are quick to criticize cities like Nairobi, Beijing and Mumbai for doing the same and displacing thousands. What's wrong with razing slums? Perhaps there's a connection between the economic prosperity of a nation that takes out its trash versus the ones that don't. The critique is that when the cities raze these areas, the tend to displace people who've built up the area over generations, and in the case of Dharavi, their is a booming economy and huge contributions to the cities recycling, leather good trade, exports, laundrying, and other industries. Often many promises are made to these original inhabitants that are not fulfilled. So the question is really how to develop in a socially just way. In the case of the Hutong, there is also a historical value to some of the structures. Charlotte, I'm reminded of something I was reading a while back, that one of the reasons for poverty is weak property rights in poor countries. If the poor don't hold clear title to their land, they cannot get loans to start a small business or otherwise improve themselves, and they are subject to these sorts of abuses. Thanks to our Constitution, when we cleared our slums the property owners were compensated for the value of whatever they owned; China doesn't have that, nor Africa. I expect weak legal systems would also contribute to promises not being kept. I read an article a while back about a slum in, I think, Bombay, where the plan was to bulldoze it a little at a time and replace it with high-rise apartment buildings. The idea was that the new buildings would be (obviously) much more modern and more sanitary, but also contain way more people. So the previous slum residents would be given a nice new apartment, free, with the additional ones sold off to fund the construction. In this way everyone would benefit. Dunno if the scheme went anywhere though. Your point about land tenure is a great one. The city of Mumbai has granted rights to slumdwellers in Dharavi who have been there pre-1995 - they will receive apartments (supposedly) while others will not. It's a very messy business - there are lots of informal networks, gangs, slumlords, and politics going on within the slum. No easy task to redevelop, let alone to do it in a socially just manner. Anyway, I think you can get a closer look at some of these issues in my video. Hope so. Charlotte makes an EXTREMELY good and valid point. The Economist recently printed an article "Lessons from an Earthquake"
"The government has paid an emergency housing bond of 6,000 soles ($2,025) to almost 30,000 families (some of whom have built new homes). It has also offered further grants of around $5,000 per family. But only those with legal title qualify. Fewer than a fifth of those who lost homes in Pisco had titles, says Juan Mendoza, the mayor. His office has since handed out another 8,500 titles, but he says this could not be done overnight." Phrases like "develop in a socially just way" are meaningless. There is NO socially "just" way of developing. Obviously, if developers are breaking the law - lying, cheating, stealing, etc - then they should be prosecuted to the fullest extent of the law. Other than that the only responsibility they have is to their stockholders. Is there any clear proof of title to any of the areas in question? Is anyone denying those existing rights of ownership? Those are the only questions that matter. If people are squatting and get dumped because of new development - well, sorry, that's the way a good economy works.